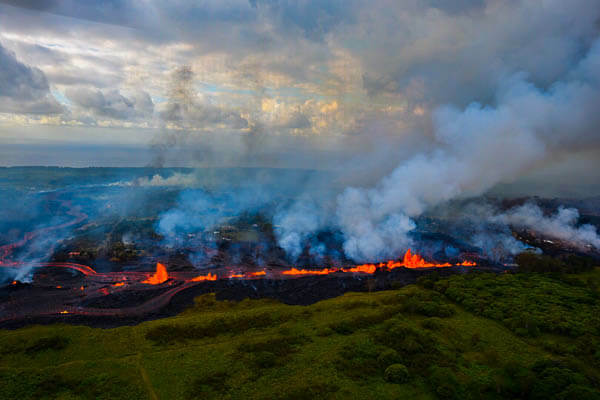 Is It Safe to Travel to Hawaii 2019 – Kilauea Eruption Update! Plus Kauai Floods! We have all seen the News pouring out of Hawaii. Gigantic Volcanoes erupting Lava flooding, the streets, destroying houses and EATING Cars! This combined with heavy flooding in Kauai. It all seems like a scene of Armageddon! For most of us, this is a combination of awe and sympathy for those affected. But what about people with pending Travel plans? How will the Kilauea eruption effect anyone heading to Hawaii in the near Future? From what anyone can tell the eruption has all but ended or more accurately paused. The Volcano is technically still Erupting but it is at some of its lowest eruption levels since the current eruption began decades ago. Great news for anyone worried about the eruption, less great for anyone wanting to witness mother natures at her most spectacular! We have left this post as it was so you can see just how incredible the eruption was. 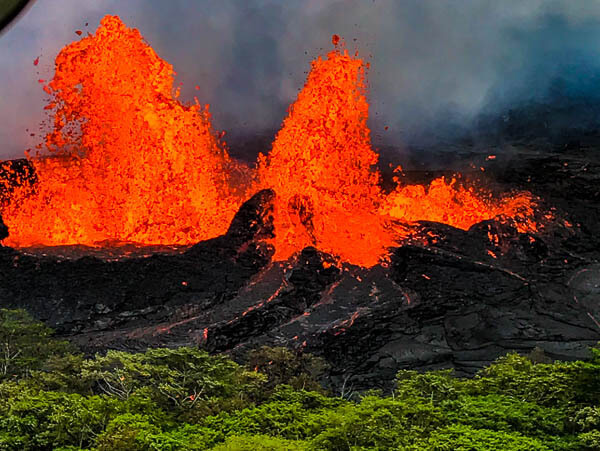 Read on for some incredible images and to be aware of just how spectacular Mother Nature or Pele can be when she unleashes the fury! But for now, the island is peaceful and serene. 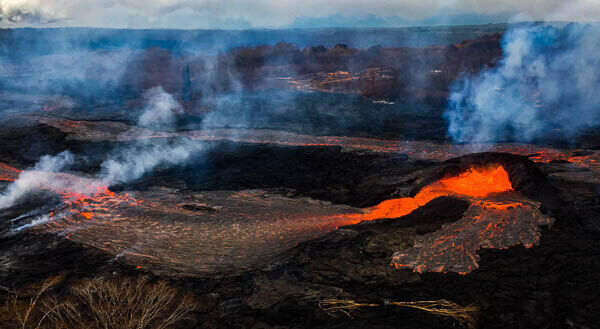 There are still significant impacts at the Kilea Summit area of the national park, but as far as safety on the island is concerned it is 100% safe from an eruption point of view…Of Course, the eruption could restart, but this is unlikely in the short term as the lava lakes refill. Fear not, for most there will be ZERO impact. The word from the Hawaii tourist bored is HAWAII is open for Business! But this is not the whole picture. What people really need to know, Is it safe to Travel to Hawaii 2018? 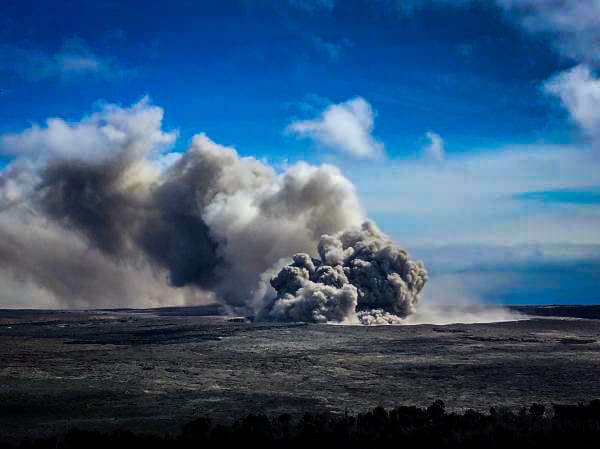 This post is designed to inform you of any possible impacts and any action you need to take with regards to the current and ongoing Volcanic eruption on Hawaii. The Good news is most people will be unaffected. Our Friends and Families all know what we do and our love for Hawaii and the small talk invariably gets round to “I bet you are glad you are not out there now”. Our swift response is “if we could get the time off we would be out there in a heartbeat”! Let’s dig a bit deeper to show you why. Some of the confusion comes from the fact the press is saying a Volcano on Hawaii is erupting! Really this is a bit vague? Hawaii is an Island chain of over 8 major islands over 500miles in length in the middle of the Pacific ocean. Exactly where the Volcano is erupting is a hugely important fact. As you can see it’s only a tiny area of the remotest part of the biggest island that is subject to the eruption. The map still isn’t the full picture there are wider implications of the eruption but it shows just how much of an exaggeration the press coverage is. Remember this has been an ongoing eruption since 1983 and has just recently ramped up. Let’s go Island by Island and See what is effected. Is it safe to travel to Oahu 2018? 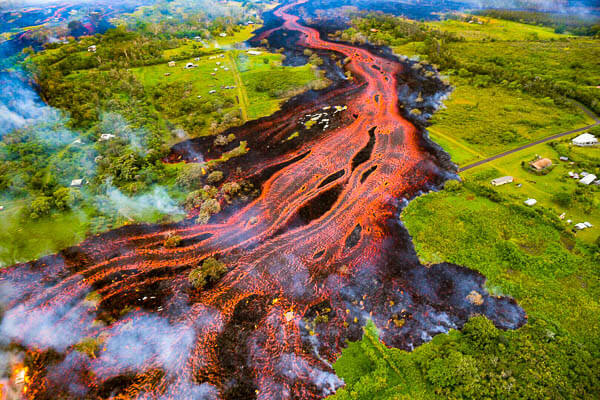 Rivers of Lava cannot reach hundreds of miles across oceans! Get on the plane. No, really there are absolutely zero effects of the volcano on Oahu. Just get on the plane and enjoy your trip to paradise! If Oahu is your only destination you can even stop reading this. There is no need for more details it is 100% fine. The only potential issue is a large explosive eruption causing a large ash cloud and the Airlines suspending air travel. This is not a safety risk as much as a trip disrupter. But the worst thing that will happen is the flights canceled and compensation offered, or you will be stranded in paradise! It’s also highly unlikely and has been an ever-present risk since 1983. And is also a risk anywhere in the world that has active volcanos. In 2010 an Icelandic volcano erupted and brought European air travel to a standstill! Would you cancel a trip based on that? In Short, Enjoy your trip, Oahu is 100% open! Is it safe to travel to Maui 2018? Maui is closer to the Big Island than Oahu but it’s still far enough away to be unaffected from a safety point of view. There is a small risk of VOG. Actually, there is a fairly high risk of VOG it’s just the VOG is a minor irritant at worst. That means there has been a bit of VOG Haze, not thick VOG conditions that are hazardous. This is a bit like worrying it might rain. It can’t be helped and will not overly affect your trip should it occur. And there have been no reports of this being anything but ordinary levels. In Short, don’t think twice get on the plane! 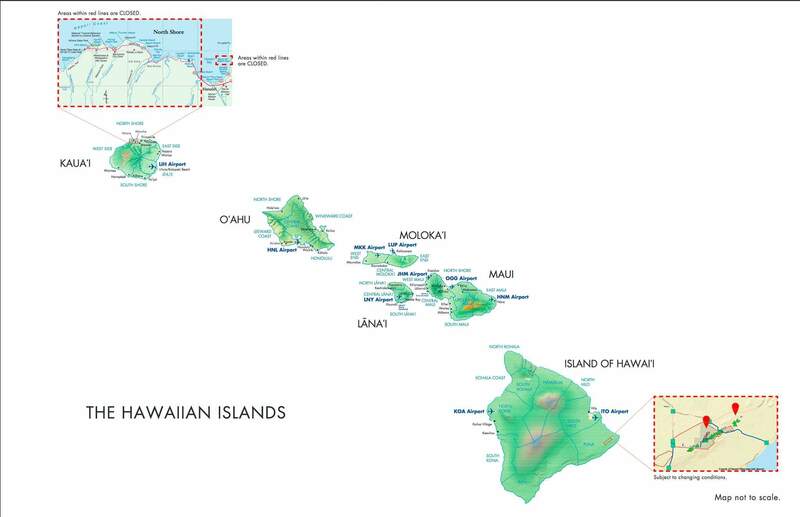 The proximity of these Islands to Maui means if you are traveling here treat as you would Maui. You are not allowed to travel here at any time, and if you are then you probably know more about this than us! Is it safe to travel to Kauai 2018? Kauai is the least affected by the Volcano of all the Islands. It’s the furthest distance and as such completely unaffected. As far as the volcano goes get on the plane. However, Completely unrelated Kauai has suffered some severe flooding as of April. Again looking at the Map above the affected area is very small. It is also not in a tourist area and should have almost NO impact on your trip. Unless of course, you are planning in staying or visiting an effected area. Mainly around Hanalei. If you are staying in this area of Kauai we would definitely recommend contacting your property and asking about their situation. The 560 is also closed beyond Hanalei meaning everything beyond there is off limits. If at all possible avoid the area. There is nothing good to be seen at the minute. Some State park are still affected too Notably the Kalalau Trail on the Napili Coast…This could be terribly disappointing for some! Check the State Parks Website for the Latest info. And don’t try and think you know better and ignore any closures. If you are lucky you may get away with a citation. If not you’ll find out WHY they are closed. In short, there are still some localised issues on Kauai due to the flooding. There are certainly no Saftey implications and most attractions and sights are open as usual. It’s no reason to cancel a trip. Worst case may be a change of location if your accommodation is affected. Is it safe to travel to Hawai’i 2018? The Big Island! Here is where things get a little complicated. Obviously, part of Hawai’i is seriously affected by the eruption. 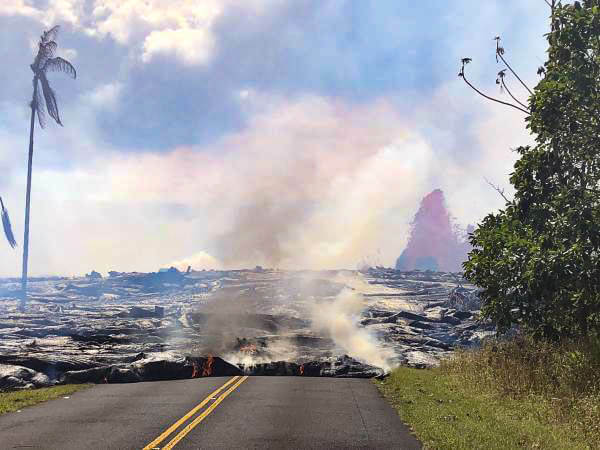 Massive quantities of Lava our pouring out of the Fissures and are causing damage to property and roads in the area. It is a terribly dangerous area to be and we would advise you to avoid at all costs! Well, we would but we don’t need to. The danger areas are completely evacuated and no one is allowed in without very specific clearance. It is not a tourist area and Lava is not just springing up in the middle of the Luau! 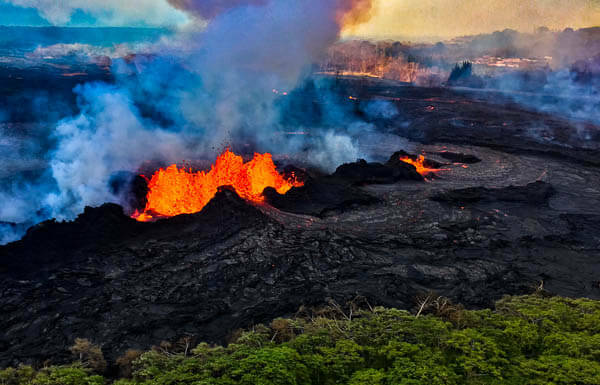 The Authorities and Experts know a hell of a lot about the Kileaua Volcano. It is the most studied in the world (Can’t think why Volcanologists flock to the paradise island?). When Pele Wakes up the guys in charge no how to deal with her. And that is get people out and keep people away! Really this is the Main reason we haven’t got on a plane. I would dearly love to witness the incredible power of mother nature forging new land right before our eyes. But the reality is the authorities have shut the place down. So we have to make do with the images and videos flooding out. Now the area affected by this is a fairly small chunk of land far away from most tourist areas. You can easily visit most parts Hawai’i and never even know anything is going on. However, it’s not all rosy. There is the Issue of VOG. VOG is an unfortunate and ever-present problem in Kona Kailua and the Kona Coast as a whole. This can and does affect the area at any time of the year. However with the increased activity when conditions are favourable to Vog it is forming more abundantly and thinker than average. Really the News from the ground is that Kona is not all that pleasant at the minute. The VOG is just a bit much. We hate to say this and really feel for any business in the area that WILL be affected by tourists staying away. Of course, we would happily recommend you visiting Kona it’s not dangerous there its just a bit grotty due to the VOG so maybe if the bulk of your stay is there it might be disappointing. If you can consider relocating, The Big Island still has lots of VOG free areas. We only really recommend avoiding Kona if you would not incur any penalty if so base your trip in Kona but head out during the day to find the clearer air if it’s bad. Some days there may be no issue it is entirely winds based. 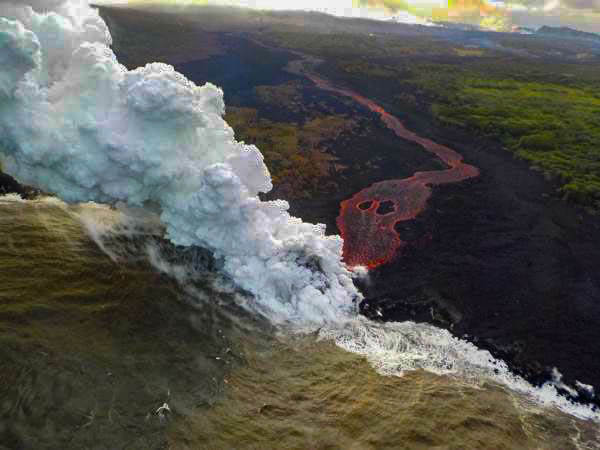 Despite being much closer to the Eruption Hilo is largely unaffected by VOG and the Eruption in general. The winds tend to push the Vog down the Kona coast and away from Hilo. The close proximity to the eruption may mean you feel the odd tremor but they will be very light and nothing to worry about. If you are staying in Hilo, We have no issue saying you should continue with your trip. Largely unaffected by VOG. We certainly suggest altering your accommodation to here is at all possible while VOG is affecting Kona area. It is a beautiful area and only on very heavy days does VOG affect the area seriously. The chances are it will be perfect for any trip in the immediate future and beyond. We really hate writing this and possibly affecting business in Kona and on the BIG island in general but people do need to know. Some Tourist outlets are advising all is rosy in Kona and not to worry! While you don’t need to worry as such as there is no risk to life at all. It’s not fair to trick people into heading into conditions that are quite frankly unpleasant. A lot of people head to Hawai’i for a dream trip. A tri[p spent in thick irritating VOG, while not dangerous is no fun. A final tip is to try to ensure if you are in Kona your room has Air-con. At least it will be pleasant in the room that way. BUT WHAT IF IT EXPLODES!!! Ah, so you have heard about the Imminent ASH EXPLOSION the press talk about. Well, this is quite possible. But it still won’t seriously affect the tourist areas such as Kona or Hilo. People think of the Deadly explosions of Krakatoa or Mount St Helens. Well, Hawaii Volcanos don’t work that way. They are what is know as effusive volcanos lave flows gradually down the slopes building up the large shield shapes that give them the name Sheild volcanos. A Large Ash eruption at the summit of Kilua may occur and it might be a very impressive sight but it poses no risk outside of the immediate vicinity (which is evacuated). The big risk from explosive Volcanic eruptions is Pyroclastic flow. This does just not occur on Shield volcano types like Kilauea and the other Hawaiian Volcanos. If Kilauea blows her top the only risk is ash fall which can be a health risk but not deadly especially if you take the advice of the authorities. Remember despite the incredible scenes of 50 Story Lava fountains, Giant rivers of lava, Huge plumes from explosive eruptions there has only been one case of injury to date! and that was an utter freak accident! Remember there is around 100 miles between the volcano and Kona including the two tallest mountains in the world. What could possible effect you with those sort of barriers. People on the ground say in the majority of Hawai’i or the big island if it wasn’t for the VOG you would not know anything was happening. In fact, the biggest complaint is the majority of the Volcano’s national park is closed and they don’t get to see the Volcano! Some people are just worriers and no amount of reality will convince them they are about to meet certain doom. Well if you just can’t get the image of a fiery death out you mind then you should probably cancel your trip. You wanted an answer to the question is it Safe to Travel to Hawai’i the answer is YES. But if that isn’t good enough you may not be able to be convinced. Just try somewhere else and leave all the bars and restaurants free for the rest of us. How long will this go on for! How long is a piece of string? I mentioned earlier that Kilauea is one of the most studied volcanos in the world…well that studying lets volcanologist know volcanos do what the hell they want! The eruptive phase could peter out tomorrow. Or it could get worse, or carry on for months or years. We just don’t know. The best guess is it will continue for at least days as the volcano will show slowing signs that it isn’t currently displaying. If the current Cycle will last weeks months or years is hard to say. It’s normally a few months before Pele has let off enough steam to go into a more restful phase. But remember Kilauea has been erupting since 1983! This could actually be the death throes of that eruptive event! But really it is all Guesswork. Anyone tells you different they are lying. Where to find more info. There are tons of really good sites out there regularly updates by real volcanologists detailing exactly what is going on. Whats going on with the Volcano? – the National Park Services official Page updated daily. This is our goto site and links to most others. 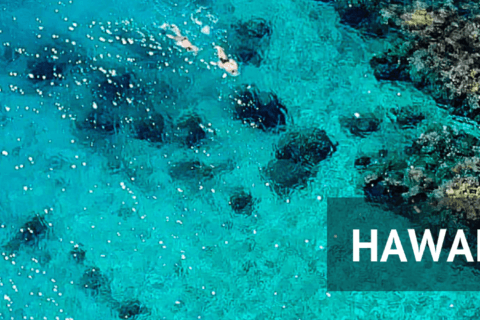 If you are heading to Hawai’i bookmark this now! Current Eruption Timeline – Just staggering images and videos from the Rift Zone, not helpful but WOW! Air Quality Across Hawaii – Clearly showing Kona as the worst Affected. UGS Hawaii Volcano Observatory – A real Science site, These Guys are the REAL deal. Take what the UGS says as Gospel …You will notice it’s quite different from the Press! Bottom line – On any of the Islands apart from the Big Island there is practically zero effect from the Volcano. On the Big Island, there are Air Quality doubts along the Kona Coast and some days are very poor at the minute. But there is absolutely zero risk to life or health providing you follow all precautions handed down by the authorities. Are you in Hawaii right now? Have you been recently? Let us know what the conditions were like. If you are planning a trip or are booked right now let us know if you have any questions? We hope we can allay your fears and help you have a trip of a lifetime. Just drop us a Comment if you have anything to say. Thanks a lot for this informative post! I’ve never actually been to Hawaii but it’s very high on my list. The islands just look stunning and I’m glad there are some that we can still visit. Did they actually evacuate the entire island which had the eruption? I was travelling around Guatemala last year and was struck by a Mag 6.9 earthquake which caused one of the local volcanoes to start erupting. The scenes were incredible (albeit dangerous) and something I’ll never forget. Wow that sounds incredible. A lot of the worlds volcanoes are incredibly dangerous. (look no further than today’s eruption in Guatemala!) And this leads many to fear the Hawaii Volcanoes. But they have a very different nature and are slow effusive types. There have been only very limited evacuation on a very small part of the Big Island. 95% is unaffected apart from the VOG. The Volcano is already showing signs of calming down and things should be back to usual soon. They think.You will be fine on any of the other islands and it is still fine to visit the Big Island as well. So vog is something that the big island gets on a usual basis? How many miles is the opposite end of the big island from the eruption sites? I feel so bad for people but so many main landers wonder why people would build so much in an area that has been erupting for years. It is a real concern. Yes the volcano has been erupting for decades and part of this is the spewing of gases that can cause VOG. As such during the right conditions VOG is an Issue on the big island year round. It is just a little heavier and more frequent at the minute. It must be terrible to lose everything to the volcano, but it is a risk the people take to live in paradise. It might seem odd to us but millions of people live in the path of active volcanoes worldwide. Hawaii’s volcanoes are very sparsley populated compared to many! Look at the City of Naples. Sitting in the shadow of Mount Vesuvius!